Pisac is a town situated about an hour away from Cusco and everyday they have an artisan market where you can get some very beautiful products. On Sundays the market is larger and quite a number of people visit the town to check it out. There are tours that actually include the market as part of their attraction but you can easily do it on your own without a tour company. 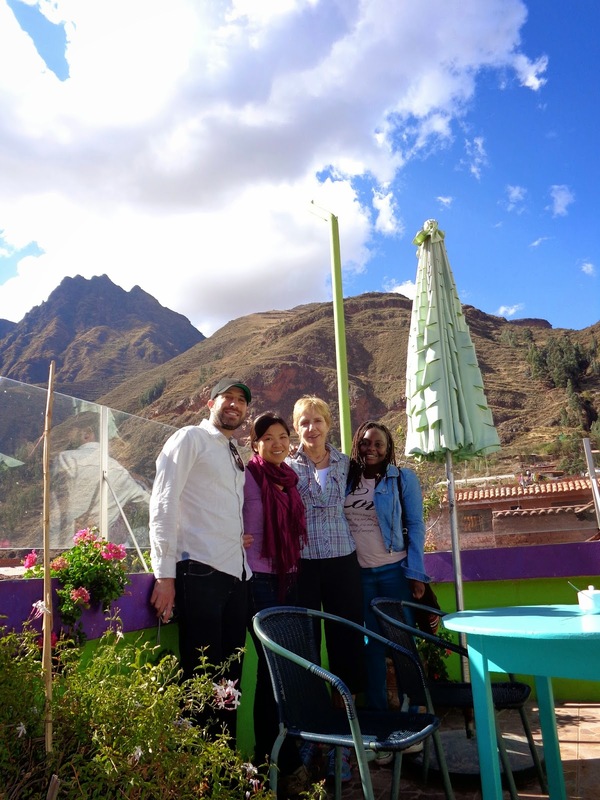 I got to visit Pisac with some of my housemates and together we decided to take a colectivo (small mini van) to the town as opposed to doing a tour. The colectivo cost about $3 for the hour long trip which wasn't bad at all although I have to say that the roads were very windy as the terrain was quite mountainous, I was actually crossing my fingers that I don't get motion sickness. When we got to the town we saw so many tourists that all we had to do was follow them to get to the market. The market itself was very colorful and it actually reminded me of the one in Ecuador, Otavalo. There were so many beautiful things that I have to pat myself on the back for not succumbing to temptation because there was great potential for doing some damage to my account. Price wise I would say certain items were more expensive as compared to what you would find around Cuzco while others were cheaper. It really depended on what you were looking for. With all the vibrant colors of course I had to take some pictures so here you go, enjoy! This was one of the streets leading to the market. Take a look at the wall hangings and table runners below, the colors! Ooh! the colors! love them!! I am not into ponchos but I have to say I saw some very pretty ones that for a minute I was tempted to buy one. Thank goodness the prices slapped me back to reality! This was a very common site, you would see some of the ladies busy at work manually creating some of the beautiful items found at the market. This lady was selling naturally made dyes and the colors were very bright I could not resist being drawn to them. I had this urge to dip my hands into them........yeah! weird I know. In addition to the artisanal products being sold there were also all kinds of fruits and vegetables. That's it folks, Pisac is worth checking out definitely especially on a lazy Sunday when wondering what laid back activities to partake in, not too far from Cuzco. There are so many similarities between the artisanal products in Peru and Ecuador. I have to say so far I think these two countries have the best artisanal products within the continent. Note that I said so far because who knows? I might go elsewhere and find even more beautiful and colorful products. Taxi drivers here are very chatty! I really don't mind this since I also enjoy chatting with them and learning something about their personal lives. There is one who told me about his wife leaving him after 30 years of marriage and he now sees a therapist because it hurts him really bad, there is one who told me about being a womanizer in his hey days although he tells his kids he never touched any other woman apart from his wife (their mother), there is one who told me he works 14 hours a day to pay for his kids' tuition in University and he can't wait for them to finish their education so he can retire and finally rest...........the stories are endless and I listen to all of them. I was hanging out with this guy I met when I first landed in Cuzco and as we were walking around town I asked him which parts are safe to walk by alone. He stopped in his tracks and turned toward me then with a very serious look on his face he whispered, "amor, the only thing you need to fear is someone trying to rob a kiss from you." it was all so dramatic and telenovela-ish especially since it was said in Spanish. I burst out laughing, I couldn't help it. He did reach for a kiss but the speed at which I swerved to avoid it was quite impressive. Really, who falls for these antics??!! I guess some girls do because I saw him at Pisac market going all hot and heavy with another girl. I was actually behind them and the only reason I noticed them is because they suddenly stood in the middle of the street and started kissing and I almost bumped into them. I could just picture him giving the same dramatic speech to the girl. My host, the British Nigerian guy was asking me if anyone has tried to touch me because of my skin color. I didn't understand what he meant until he told me that people try to rub his skin all the time for good luck. Apparently there is a belief here that rubbing the skin of a black man brings good luck. He was narrating how he went to a hot spring once and people would try to be sneaky by gliding near him to rub his arm or leg, it was actually funny how he narrated it. Maybe this only applies to men because no one has tried rubbing my skin. My hair on the other hand has been receiving plenty of attention. I get so many compliments from both men and women and these two ladies I met even told me that if I ever cut my hair I should sell it because they know people who would buy it. Hmmmm? if I ever go broke in Peru at least I know how I can get some change for food.